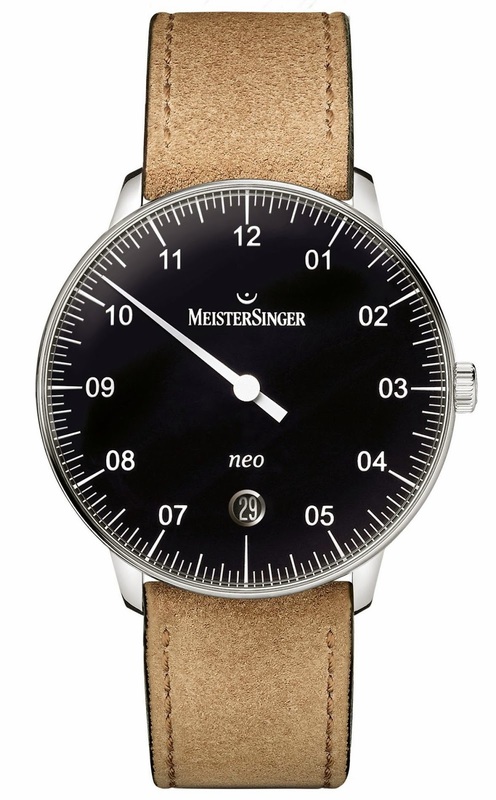 MeisterSinger, the Germany based manufacturer of single-hand watches, re-launches Neo, the leanest and flattest of timepieces from the brand. It is one of those timepieces that appear ultimately familiar in its measurements and design, as if it had been around for decades. Its diameter of 36 millimeters, the thin bezel and the Hesalite glass make the Neo seem like it was created in the 1950s. However, not in an old-fashioned way, but embracing the modern aspects of the decade. After all, the 50s was a time of creative awakening and, above all, the renunciation of superfluous embellishment. The unadorned clarity of the dial also follows this tradition, although it was only designed half a century later by Manfred Brassler, the founder of MeisterSinger. The discreet size of the Neo remains unchanged. Thanks to its thin plastic glass, the Neo is only 9.7 millimeters high. The neat relief ofits steel screw-in back shines just like the sunburst pattern on the silver-white and blue dials. Two additional versions of the Neo are available with either a black or an ivory lacquered dial respectively. The Neo Q is the Neo’s quartz-powered sister model – and a good choice for anyone who does not attach great importance to a mechanical movement. Many people are bothered by the nervous twitching of the second hand on common quartz watches, which the Neo Q isn’t fitted with. Its single hour hand moves just as sedately as that of its mechanical counterpart. The Neo Q’s typography has also been rejuvenated. It bears new lettering and the date is now displayed in a round window. However, its design still clearly differs from that of the Neo with the automatic movement. Instead of the imprinted hourmarkers, the Neo Q is equipped with appliques. An additional version has been designed with festive golden digits and a matching golden hand. 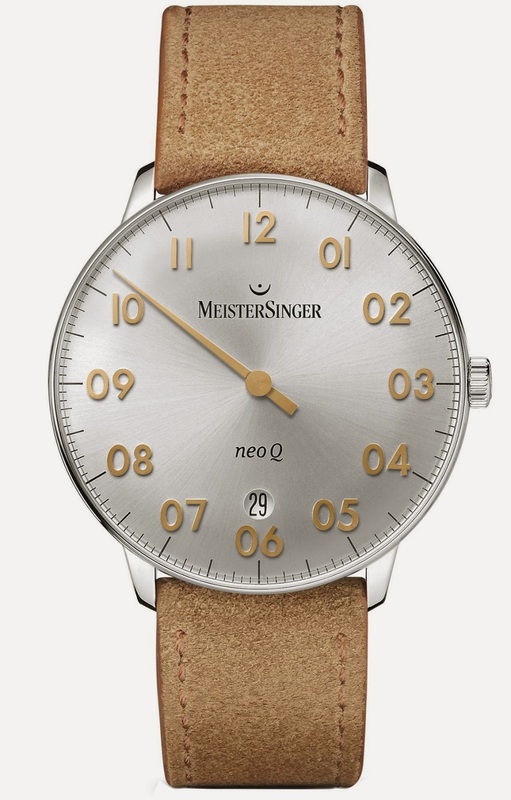 Another unique feature of the MeisterSinger range is the quick-change system of the Neo Q watchstrap, which comes in two entirely different styles as standard. Besides an elegant, embossed calfskin watchstrap, it also comes with a soft suede version, expressing the relaxed attitude of all MeisterSinger aficionados, who appreciate tradition but are not bound by every single convention.